In my opinion nothing beats the warmth and rustic beauty of natural materials. Many people choose natural building materials to save money, and that makes perfect sense. But let's not overlook design aesthetics. A home is much more than just an assemblage of materials. Natural materials have a way of seamlessly blending everything together, turning a house into an inviting home. Kelly and Rosana Hart's earthbag house is one example of this. Made almost entirely of locally obtained, natural materials such as earthbags filled with crushed volcanic rock (for maximum insulation), earth floors, stone and recycled materials, this home has become the quintessential natural home, having been featured in at least 10 books and magazines. Everything about this home draws the eye and invites the touch, from peeled timbers and roof poles that angle up like a tipi, to custom pine cabinets, a stone shower and hot tub, to built-in benches. Arched and round windows allow for passive solar gain and views of the surrounding mountains in all directions. The home features a sizable walk-in 'cool pantry' that uses no electricity. Due to its earth-bermed design it maintains a fairly steady temperature year round. The temperature ranges from a low of about 36 degrees F. (in the dead of winter) to a high of about 65 degrees F. in the heat of the summer. 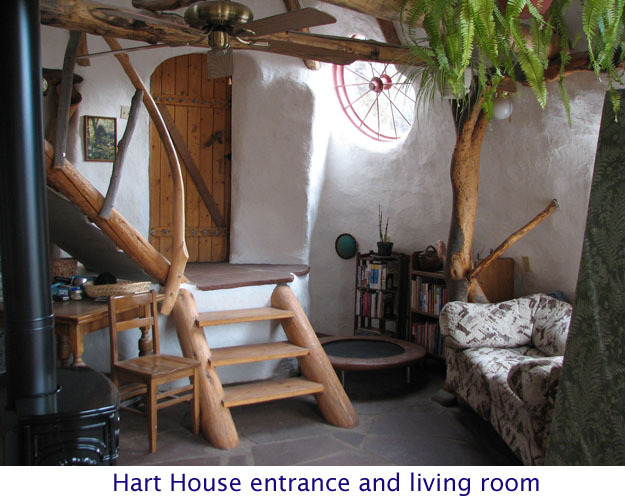 I had the good fortune to live in the Hart's home a few years ago and I experienced first hand that it remains comfortable even through Colorado Rocky Mountain winters at nearly 8,000 feet above sea level. Owen Geiger (Director of the Geiger Research Institute of Sustainable Building at GRISB.org ) and Kelly Hart (owner/author of GreenHomeBuilding.com ) have teamed up to create EarthbagBuilding.com to better focus and keep track of the rapid growth of this novel building method. 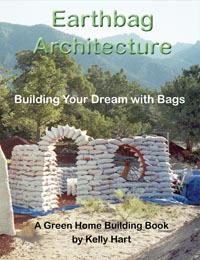 And for all the latest news, building tips and innovations, visit our earthbag building blog at naturalbuildingblog.com.